Natura font family is a modern typeface that was born of a very interesting idea. The font’s designers found inspiration for it in the notebooks of the great explorers of the natural world. Those are a big part of the heritage of the civilized world as they contain the notes and the drawings of these brave men whose scientific contribution helped changing the course of history. 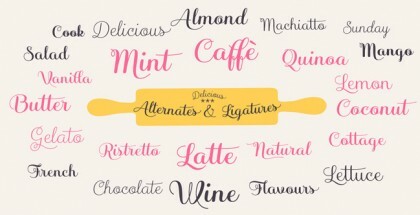 As you can imagine, Natura font family is quite artistic and elegant and aims at celebrating life in all its forms. The feeling you get when watching it is one of pure joy and pleasance. This is due to the careful calligraphic approach of the designers – each letter was firstly drawn with a fountain pen and then the glyphs were meticulously digitalized one after another. Overall, the elegant appearance is perfect for use as T-shirt logos, signage, invitations, cards, packaging, labels or different kinds of project that require individual approach and which goal is to make instant impression and catch people’s attention. Natura family includes several different fonts that are created very carefully. They vary distinctively from each other and offer numerous possibilities to the users. Natura Regular is quite flexible, providing a lot of ligatures and swashes as well as other OpenType features. 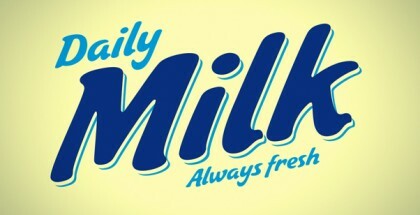 Natura Slant font is equally functional but, in order to add more elegance, the angle was changed. Natura Notebook is distinctively narrower and upright, offering great legibility. 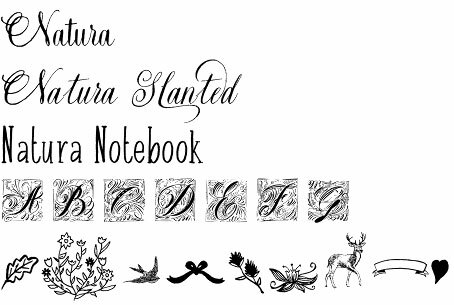 And finally, the family is completed by two very interesting fonts – Natura Icons which features hand drawn ornaments like plants, leaves and animals and Natura Stamps – a collection of nature inspired capital letters. Natura font family is published by Resistenza type foundry. Enjoy more of their great work: Nautica, Attica RSZ , Superb, Rachele, Two Fingers, Mina. Get Natura and feel yourself a part of Mother Nature!